Ultrafine bubbles, Nanobubbles, dissolved Oxygen, micro bubbles, milli bubbles, the world of bubbles can be confusing at times. Bubbles are gas-filled cavities in water, they remain suspended in water, dissolved oxygen are unbound oxygen molecules in water. Unbound oxygen behaves differently and it's important to understand the difference between a dissolved gas and a gas cavity. Milli-bubbles are bubbles smaller than one millimeter in diameter, but larger than one micrometre. 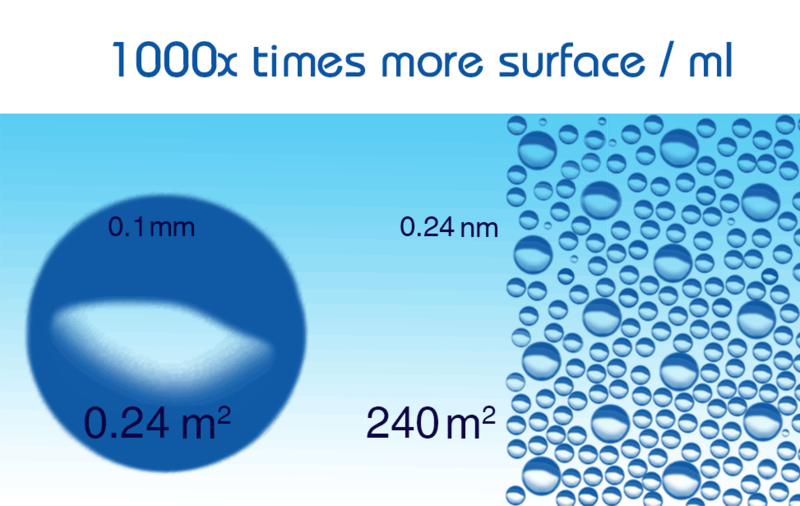 Micro-bubbles are small bubbles with a diameter between 10 to 50 μm and decreasing in size and lastly disappear under water. 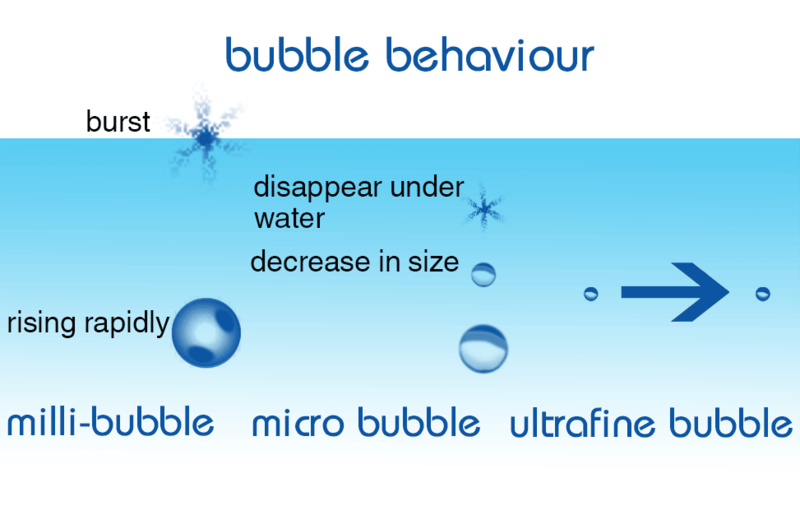 Nanobubbles or officially ultrafine bubbles are miniature gas bubbles in liquids with a diameter smaller than 200 nm, and have several unique physical properties other than ordinary milli-bubbles. They remain stable in water for a long time because of their negatively charged surface which can be calculated by the zeta potential, were as milli-bubbles increase in size, rise rapidly and burst at the water surface. In the same volume of water, the contact area between bubbles in water filled with tiny bubbles is much larger than water filled with bigger bubbles. The increase in the contact area enhances i.e. the aerobic bacteria activities in the liquid by using oxygen gas or anaerobic activities by creating nitrogen bubbles moverover the efficiency of chemical reactions is increased between the supplied gas and liquid ingredients. In practical applications CO2 is easier available for algae and O2 is easier available for plant roots, or aerobic bacteria in soil remediation. In the picture when we look at that mathematically: When generated, small bubbles can be created at higher concentrations than larger bubbles. The surface area of a volume of bubbles is in inverse proportion to the bubble diameter; thus, one mL of 100 nm diameter bubbles (2x10.15 bubbles) has 1000 times more surface (240 m2) than one mL of 0.1 mm bubbles (2x10.6 bubbles, 0.24 m2). Bubbles have 3 components, gas phase, shell material and aqueous or liquid phase. The gas phase is the gas inside the bubble which is a single gas or a gas mixture. The shell material, water or a liquid surrounding the gas phase. The bubbles formation and the mechanical properties of bubbles depend on the property of shell material. The last component is aqueous phases which are the liquid or combined solution surrounding the shell material. Furthermore, fine bubbles have an electrically charged surface are able to generate free-radicals with the micro-bubble collapse. In addition, some researchers reported that air micro bubbles were pseudo-elastic and spherical in aqueous solutions. Regarding the fluid dynamic properties bubbles have a low rising velocity in the liquid phase and low reducing frictional resistance. Bubbles in pure water are negatively charged. The zeta potential measured in water with oxygen fine bubbles was from -45 mV to -34 mV while air fine bubbles a little lower which is from -20 mV to -17 mV. The large specific surface area and charged surface enable tiny bubbles to effectively absorb opposite charged molecules and / or small particles. 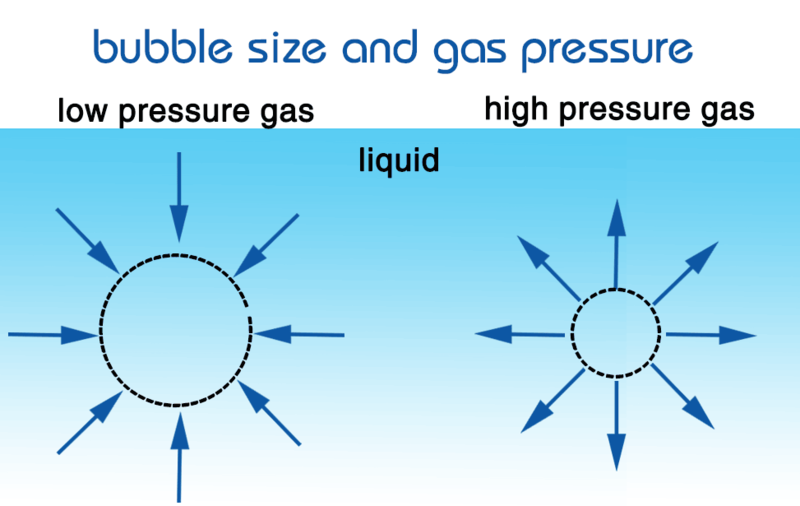 The gas pressure inside a small bubble is higher than in a large bubble, therefore the surface tension of a small bubble is higher as well. For this reason the gas of a small bubble dissolves quicker than that of a large bubble. Small bubble rise slower than large bubbles to the top of the water surface, because of this extra time the gas transport from bubble to liquid is more efficient. Small bubble coalescence less (stick less together) than large bubbles, this is beneficial because when bubbles get bigger they raise quicker to the surface giving them less time for gas transport. In the table below examples are given of the pressure inside the bubble depending on the size of the bubble, the calculations are based on the Young-Laplace equation. The diameter of the bubbles in water is reflected in buoyancy and rising rate. The rising rate depends on the solution properties, and Reynolds number corresponds to approximately 1 at about 100 μm of diameter. In addition, in the case of Re < 1, Stokes Law adapts well because bubbles behave as balls due to flux conditions on interface of globular bubbles. Based on the Stokes law in the table are given 3 examples of different bubble sizes and the rising speed of a bubble in water. Since ultrafine bubbles are so small and move through the liquid randomly the stokes law is not applicable to them. Understanding the physicochemical properties of a compound such as solubility, stability, form definition, solid-state properties, partition coefficient and ionization constants is essential. Among the physicochemical characteristics of micro-nanobubbles, there is the large specific area and the high pressurization of gas inside the bubble, which confer to these bubbles high gas dissolution capability. The smaller the bubble size, the higher the oxygen pressure pO2 values in water, suggesting that nano-bubbles increase the pO2 values in water to greater extent than that of micro bubbles (10-50 micro meter in diameter). Why do ultrafine bubbles live so long? In laboratory circumstances there is the possibilities that bubbles can be kept for 3 to 6 months, I real life applications it is much shorter. The likely reason for the long-lived presence of ultrafine bubble is that the ultrafine bubble gas / liquid interface is charged, introducing an opposing force to the surface tension, so slowing or preventing their dissipation. In an electrolyte solution the positive ions become concentrated around the gas nucleus due to its negatively charged surface and act as shells that prevent the gas from dispersing (the salting-out phenomenon). Due to this characteristic of ion behavior, ultrafine bubbles remain stable for more than 6 months in electrolyte solution.